School is now in session! I can’t believe that I am actually writing this post. Gwen started Kindergarten this past week and she pretty much thinks that makes her the boss of everything. (yes she does say that too) Here she is first day in her seat. She wasted no time walking into the class she went straight to her chair and busted open the crayons and started coloring. She is serious about coloring. I was trying to get her to look at me for a nice picture but this was all that she would give me, then she told me “see ya later mom” and just like that I was out of the picture and she forgot all about me. So I moved away and took a few more photos and then went home. So while Gwen was away at school Harrison, Stella and I played cars, built with the blocks, cleaned a little, and made cookies for an after school snack. Harry taste tested them for me, and he said that he was going to need a little cup and plate (saucer) with milk to do that. So what can I do but comply to such a request. At 2:20 we packed up the kids, and the cookies and left for the school. We made it in time to see the routine that the kids will finish off the day with as they separate into groups for buses, parent pick up lines, and after school activities. Gwen trotted off to the car (parent pick up) line and Harry snuck in right behind her, I don’t think that the other teachers even noticed that he was not wearing a backpack or a tag saying which class he belonged to, he just fit right in. One of the teachers had to wake him up so they could take the line to the front of the school. Poor little thing. 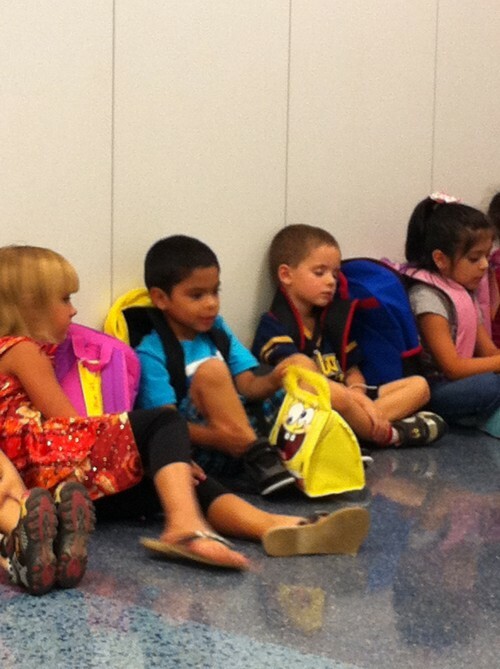 Kindergarten must be pretty tiring. 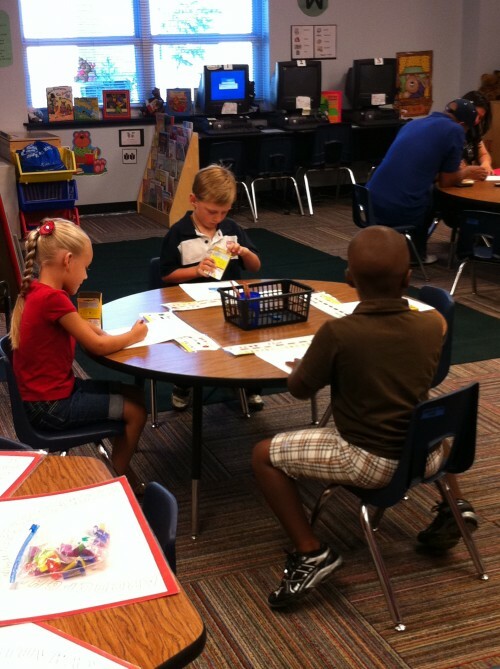 So our first child has now completed her first week of kindergarten and our family is adapting to a new schedule. Welcome to a new life, at least that is what I keep telling myself. Eric starts tomorrow! He only has 1/2 day kindergarten so our lazy mornings won’t be totally changed. 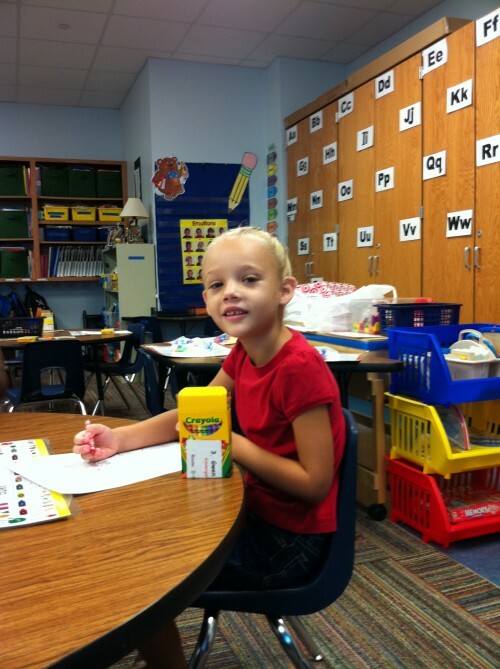 Gwen is such a cute little kindergartner! I’m almost getting teary-eyed looking at this. Look how grown up Gwen looks. I love that you are setting an alarm. I’m not looking forward to the day where we no longer wake up at 8:00. This phase of life is heaven. Wow! that seems incredible that she is old enough to go to school. Congratulations on making it through the first week! So were you sad she started? I am glad she is liking it. Ok really?! Check that girl’s birth certificate! Weren’t we JUST working at Einstein’s like last summer?! Weird how time flies! How fun for Gwen…and I loooove her leopard shoes! She’s so hip! The first kid in Kindergarten IS so traumatizing! It still hurts when I think back. I wish I could say it got easier but it doesn’t. Every year it just about kills me to leave them behind. They don’t care if I leave them but I do. I’m sorry and I’m happy for you. It’s a strange new world ahead of you. You said pick up was at 2:20? When do those kids get in? We start at 8:00 and kindergarten pick up is at 1:30. You guys have a serious kindergarten there. Little Gwen looks so big and confident sitting in her chair with her sassy leopard mary janes. Enjoy being able to direct clothing ideas for your kindergartner because when they hit 1st grade there is no more direction. They want sketchers, so they can run fast, and mom is left in the dust wanting those cute little mary janes. It looks like Gwen did great following the rules and following the directions. See no worries. Yayyyy for Kindergarten! I love Gwen’s cute lil leopard shoes! Where can I get some of those? I love these blogs, I keep coming back and seeing them again. I too cannot believe that my baby Gwennie is going to school. It’s taken me these couple of weeks to actually process all this. Love you all. You have a kindergartener! Crazy! 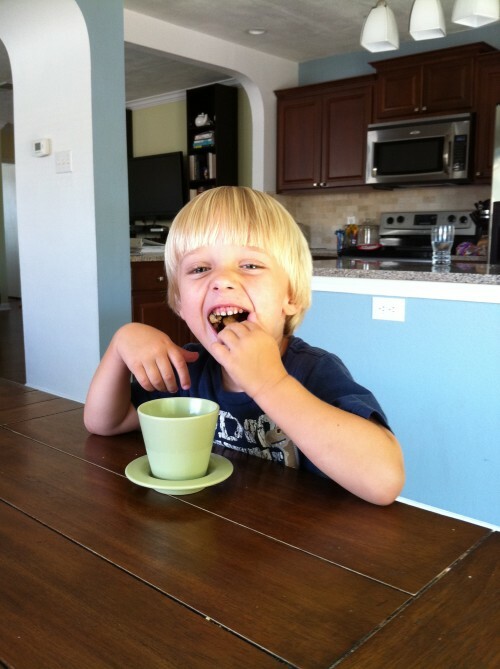 Also your kids are adorable and your blog is so fun to read! Love it! Previous post: Last Call for Family Fun!